Alicante webcam or Alicante web cam as many people spell it, is simply a digital camera directly connected and linked to a computer which in turn is connected to the Internet. Some people also refer to these web camera as web cam Alicante cams. These Alicante webcams and Alicante web cameras set up in the city of Alicante are constantly on and transmitting and streaming live video, pictures and images of Alicante that you can see from your computer wherever you are in the world. Alicante is the gateway to the Costa Blanca area of Spain, known for it’s small fishing villages along the coast with many miles of sandy beaches and great weather. As the Alicante webcams will show you there is more to Alicante than many people think. Most people arrive at Alicante airport and leave the city of Alicante but Alicante has a great port area, castle and has it’s own fantastic beaches so it is a tourist destination in it’s own right. Some Alicante webcams transmit live up-to-date streaming images of Alicante and other Alicante webcam show views and images of Alicante from earlier on in the day. Below we have a list of available Alicante webcams. Just click on the links to see live webcams of Alicante. Webcam of Alicante Old Town – This Alicante webcam gives a glimpse of the old town centre of Alicante with it’s historic buildings and ancient squares (plazas) which come to life in the evenings. 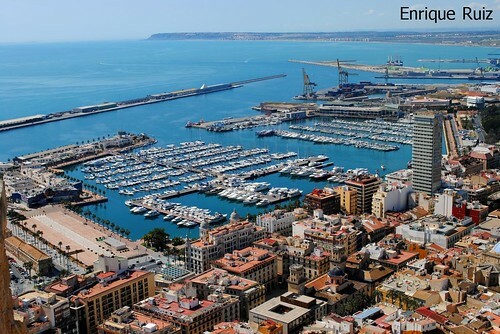 Webcam of Alicante Port – This Alicante webcam shows the port and marina area which is full of boats and very expensive yachts. A good place to stroll in the evening and have a drink and eat at one of the many seafood restaurants. Webcam of Alicante Promenade – The Explanada de Espana is a famous promedade with a patchwork quilt of colourful tiles as well as hundreds of palm trees. Perfect for a walk, the Explanada de Espana stretches from the port and marina to the start of the beaches with the city centre just behind. If you are interested in webcam Alicante and web cam of Alicante then we expect you may be interested in our many other pages devoted to information on Alicante – in particular you may be interested in our Alicante weather page or you may need help with hotel accommodation in the Alicante area. Below we have a quick weather widget showing todays weather in Alicante including the current temperature. Alicante webcams are great for people who have never been to Alicante and who want to see what Alicante looks like. Alicante webcam are also very useful for people who are considering visiting Alicante on holiday. If so the pages below will help you with all sorts of things such as finding a villa for rent in Alicante, hiring a car in Alicante or booking a hotel in Alicante etc.